Your chances of success are largely influences by the level of your clarity on what you want; and you cannot be clear on what you want until you set your goals. 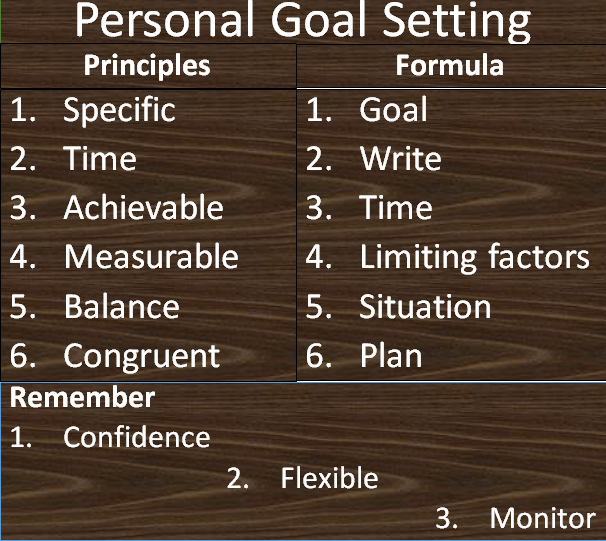 Goal setting help people to make a plan and focus on achieving the set goal. It also help you to focus your mind and imaginations. You will be surprise to know that many people set goals and budget for corporate firms but they have no clear written personal goal(s). This article explains about the key principles and formula of setting a personal goal. Time bound – Your goal should have a realistic deadline and schedules. If you didn’t achieve your goal by end of that time, you can set another deadline but it is important to set deadline for all your goals. Sub deadlines for your bigger and long-term goals can also be helpful. Achievable – Set a goal that is achievable within the time frame. I am not saying some goals are not achievable in life but within certain time, the chances are very low. Imagine someone who earns $1,000 per month set goal of becoming a dollar millionaire within 1 year. Measurable – Can you measure your goal? If the answer is no, then you need to revisit that goal. Balance – It is important you set goals that relates to yourself, God, Family and then the environment. No one can achieve anything without the influence, support or benefit of these parties. Congruent – Your goal must be compatible with your personal values and the other goals. The relationship between your values and goals can affect your success. You cannot set a goal to be the best butcher in town when your do not believe in slaughtering animal. Now, we can set out the key step to follow in when setting your goal. Write it – Do you observed that the most valuable commitments are usually in written form? This includes your certificates, agreements, employment letter, title-deed, bank statement, financial position, holy book etc. It is important you write your goals. What or whom do you need to achieve the goal? – You should make a list of every skill, connection, knowledge and people you need in other to achieve your goal. In finance, we called them the limiting factors. If your goal is to be a banker, you need to read a recognized banking and finance course and graduate with a good result. In our example, Lamin need money ($20,000), time, family support etc. Action plan – After setting your goal, deadline and performed the self-assessment, you need to develop a good action plan. List the tasks with schedules and priorities them. Action on each task and work with a sense of urgency. He plan to save $7,000, apply for student loan or his Father’s support if his savings cannot close the gap. Monitoring – When organizations set goals they will review and monitor the progress. Individuals are also supposed to monitor their goals and plans. For example, if you set a goal to buy house in 5 years’ time, you need to review your financial status at least on an annual basis. So what happens if you don’t have a plan in life? Well, it reinforce that you are “not in control.” You will accept things as they come in life. One day you will read fashion course because your friends are reading it and next year you will read banking because new banks are opening. 2 Comments on "How to Set your Personal Goal"
Thank you Beth. I agree with you that goal breakdown helps a lot.